Recently, UltimateBet.com held a $1 million guaranteed no-limit Hold ’em tournament. Surprisingly — for a guarantee of that size — the buy-in was only $500. Incredibly, there were 2,774 players, and the prize pool was a whopping $1.387 million. First place was $260,000, pretty amazing for a $500 buy-in poker tournament. Only on the Internet! But back to UltimateBet.com. The tournament started at 12:30 p.m. PST, and I (“PhilHellmuth”) finished at about 2:30, in roughly 1,983rd place, when my Ah-6h lost to my opponent’s 10-10 after a cold-blooded flop of 10-6-6. At 7 p.m., with about 100 players left and Reitman (“HHumbert”) still in there, Duke went off to do her final-table commentary for UB at a studio in Los Angeles. As it turned out, she was given the wrong address, and ended up driving around Los Angeles for the next 90 minutes. Meanwhile, she couldn’t reach Reitman on the phone. So, ever resourceful, Duke called the studio and received minute-by-minute updates. Finally, she arrived at the studio and watched Reitman, still alive with 33 players remaining. Believe me, the irony of Duke watching Reitman play poker for hours — instead of the other way round — isn’t lost on me. 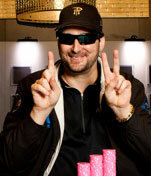 In any case, as Duke watched from the studio, Reitman took the chip lead with two tables left. Meanwhile, Duke, who had a 50-percent interest in her boyfriend’s result, was taking phone calls from UB listeners around the world. And when Reitman made the final table, Annie was announcing the tournament from her Los Angeles studio perch. Can you imagine? Here was Duke, announcing her longtime boyfriend’s final-table play (time delayed), while having a half-interest in the result. By the way, I have been staking poker players in online tournaments for years, and none of them has ever made a final table! Of course, looking at Duke’s staking result here, I realize that I may have made a mistake by not staking my wife in one of these events, LOL (Internet lingo for “laugh out loud”). With four players left, the blinds at $20,000-$40,000, and the antes at $4,000 a man, Reitman — as the first player to act — made it $120,000 to go with A-K. At this point, he had $2.4 million in chips; “Shyky,” in the small blind, had $1.3 million in chips; and “Trapster,” in the big blind, had $2.1 million. Now Shyky called the $120,000 bet from the small blind, and Trapster called as well. Duke tells me that this multi-way pot was unusual, as most times the original raiser either won the pot, was reraised, or was called by just one other player. Not called by two. Now the flop came down A-6-3, Shyky bet out $360,000, and Trapster moved all-in for about $1.9 million. Now the action was on Reitman (HHumbert). Duke, in the announcing booth, said, “If I were in HHumbert’s shoes, I would need A-K to even think about calling the bet, but even then I would fold it. Why put your whole tournament at risk, when Trapster probably has at least two pair, and may have three threes?” Duke also relayed to the listeners the fact that Shyky was playing solid, and Duke thus felt that it wasn’t likely that Shyky was bluffing. The fact that both players presumably had a strong hand was one more reason for HHumbert to fold his hand. Duke then headed home, where Reitman was waiting to celebrate his victory with her. Duke told him, “It’s a good thing you were playing in this thing and not me, because I would have folded the A-K.” Even though she was teasing Reitman about his play, she admitted to me that she thought he had played extremely well all day long.